When they left from Addis Ababa early in the morning of Sunday October 5, the two Europeans, James Cator from England and Daniel Dormeyer from Germany, accompanied by two Ethiopians, Minassie Alemayehu and Haile Mekonen, did not really gauge the significance and importance of what they would experience when attending Irreecha in Bishoftu, Oromia regional state, around 45 minutes south of the capital. With almost one third of Ethiopia’s population, the Oromo constitute the largest ethnicity in Ethiopia and the wider Horn of Africa. Cator and Dormeyer had just arrived, excited about a country charged of history, culture and noble values, and willing to overcome waves of preconceived ideas about Ethiopia. Established by Oromo forefathers, Irreacha (also called Irreessa) takes place annually throughout Oromia and amongst Oromo communities abroad on the first Sunday of last week of September or the first Sunday of the first week of October according to Oromo time reckoning (Dhahaa). Bishoftu hosts the major gathering of a festival believed to be one of the largest in Africa. Known as Oromo’s Thanksgiving to their God (Waaqa) for his goodness over the past year, Irreecha marks the beginning of a new lunar calendar and a seasonal change from winter to spring, and more particularly the end time of starvation (Gadaa Belbaa), disunity, chaos (Mormor), and the auspicious occasion to wish plentiful harvests in the upcoming year. After a pleasant drive through enchanting though unexpected landscapes on the uncrowded highway in the wee hours of the morning, during which they wondered about a dead hyena and the probability of getting hit by a car, the multicultural group of friends finally reached Bishoftu. Bishoftu means “the land full of water” in Oromiffa language. Indeed, the main ceremony would take place at the Lake Hora Arsadii. In fact they reached sacred ground, where Oromo people believe God will grant all their wishes. The car needed to get parked right before a blocked area. It was a short, but already crowded walk down to the lake. The rising sun dispelled the last clouds around Bishoftu, and casted bright spotlights on first waves of chanting and dancing people running down the street and moving towards the venue. 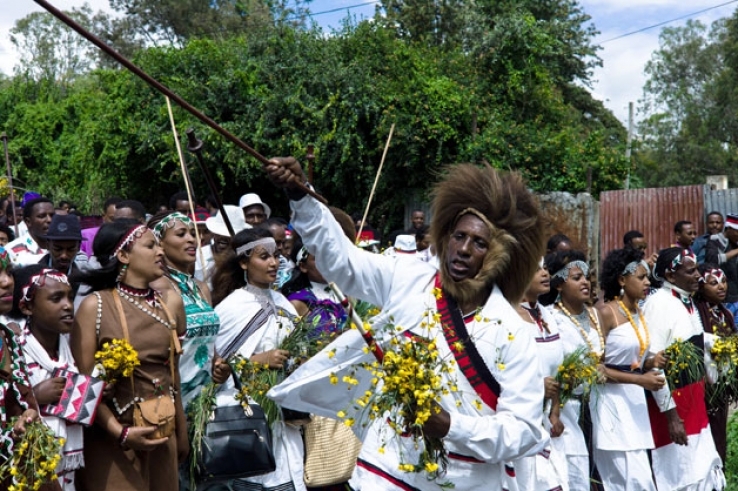 Like tens of thousands of Ethiopia’s ethnic Oromo, they gathered for Irreecha to celebrate the transition from the dark and challenging rain season to the sunny new Birraa (Spring) season. Even though some habitants got together in front of their homes around a delicious coffee while teenagers were still playing football, they knew that new waves of people from different parts of the country would arrive soon and just take them along to the ceremony. The effervescence, an irresistible attraction was already palpable. “I was so impressed by the huge number of people, all beautifully dressed and moving ahead peacefully and cheerfully. A real festival of colors. I can’t remember having seen in my country such a traditional event respected and followed by so many people and with so much passion.”, Cator says. The group of four bought scarfs in the traditional white / red / black colors and a green tree on it, as well as the green grass and yellow flowers (umama) to comply with the tradition. Indeed, everything related to Irreecha has a meaning and a purpose: for instance the Oromo gather in symbolic places such as hilltops, river sides and the shades of big sacred trees. Green being a symbol of fertility, peace, abundance and rain. At Lake Hora Arsadii the three predominant Oromo colors on the Oromia’s traditional dressings sticked out of this huge green area. Waves of joy and happiness brought the pilgrims and the group of four to the shores, amongst thousands of people already standing there and waiting the elders to stir long grasses in the lake before sprinkling the blessed water. They believe to get blessed as well and that it will bring them closer to Waaqa (God). Many of them also made presents to thank God for the blessings and mercies received in the previous year. In the distance various boats could be spotted on the lake, sometimes with newly married couples aboard. An older man started explaining the spiritual significance of Irreecha to Minassie and his obligation to convey the meaning of a ritual that has been passed down many generations and that will be passed to the next ones. Then the group of friends also dipped their grass in the water, trying to imitate the repetitive hand movements people did to reject all possible bad vibrations while making wishes. Probably more generally about peace and health when the Oromos praise God also for fertility and abundance with regards to the one who matter to them, their livestock and the upcoming harvest. Overwhelmed by this visual feast of colors and the irresistible vision of fraternity, the four friends climbed back to a clearing where the main ceremony would take place. The white seats in the shade of the big sacred trees they spotted when walking down to the lake were now occupied by the central persons of the blessing festival. At this very moment the group of four realized the union of three dimensions of Irreecha: religious, political and social. First this thanksgiving embraces all religious persuasions: Christians (amongst them Orthodox, Protestants), Muslim and Animists. They all came to thank the higher force and pray for a fruitful harvest. Second Oromos from all ages and all stripes gather to Irreecha, sharing the same values and respect for the traditions. Third various officials (speaker of the House of Peoples’ Representatives, officials from the Ministry of Culture and Tourism, President of the Oromia Regional State) performed in harmony with the honored Abagedas (the elders, the traditional leaders of the Oromo community, elected according to the traditional Gadaa principles). The speeches were held in three languages: English, Amharic and Oromiffa. Solemnity, pride, confidence and magnificence emerged from the speeches, reminding people about the uniqueness of this highly symbolic and truly global event. Warmth was in the air and also in the words. Besides the respect of tradition and the awareness for the Oromo culture and history, this unique event symbolizes the pride and rise of Ethiopia. Elites and supporters got encouraged to help paving the way for promoting Ethiopian values of sharing and fraternity conveyed by Irreecha, but also to convince the United Nations Educational, Scientific and Cultural Organization (UNESCO) to register this outstanding festival on the representative list Intangible Cultural Heritage of Humanity. “The holiday is the only occasion, to the best of my knowledge, that brings together members from all religious persuasions to honor it. Seeing the masses attending this day is an evidence to how people here have not abandoned their traditional values even as they embrace modernity. It’s no wonder that it is a candidate for UNESCO’s World Heritage list with generations after generations protecting it,”Minassie says. When the group of four left, they walked back against further, even more massive waves of people joining the celebration. Waves of peace (Nagaa), freedom (bilisummaa), unity (tokkummaa), and reconciliation (araara), bringing people closer to each other and making religious, political and social bonds. The two Europeans perceived Irreecha also as a positive movement against many waves they are experiencing in their societies: tradition resisting to modernity (people still looking for endorsement by the elder), all ages united instead of generations divided, all social classes brought together rather than class struggle, all confessions in harmony unlike so many parts of the world. This year Oromos celebrated the Irreecha blessing festivities in millions. The group of four felt proud and honored to have been part of this movement. And they simply let themselves go with these positive waves.